Detail view of crannog mound with timbers showing, taken from the east. General view of crannog mound, from east. 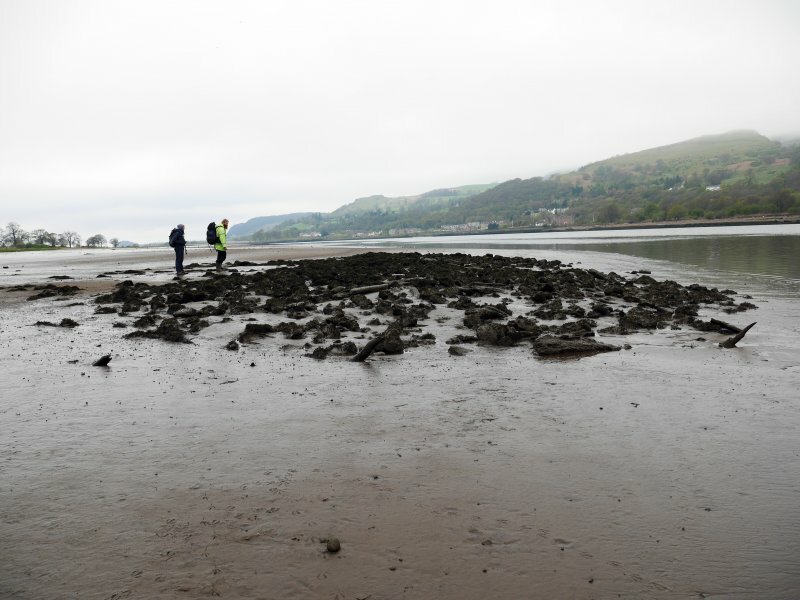 The existence of a well-preserved oval shaped crannog, approximately 30m by 40m was confirmed. The site was planned photogrametrically from vertical photographs kindly provided by 819 Naval Air Squadron, HMS Gannet. Ground checking of the plan revealed several examples of jointing in the timber sub-structure and the broken topstone of a rotary quern. Seventeen timber samples were removed for dendrochronological analysis. Unfortunately, most proved to be alder and the oak samples failed to provide a date. W S Hanson and J Macdonald 1985. NS 4554 7288 This site was investigated in 1985 (Hanson and Macdonald 1985); it was assessed again in the summer of 1997 for an erosion survey. The exposed surface timbers are very badly damaged by both insect attack and tidal erosion. The site, the surrounding sandbanks and present HWM were contour surveyed. There was no evidence of a causeway connecting the site to the shoreline although this may be buried by the sediments which have accumulated to the S.
Sponsors: Society of Antiquaries of Scotland, Wingate Foundation. NS 45482 72901 (Canmore ID: 43313, SMR: 12891) Four timbers and three stakes were collected from the eroding intertidal platform in the Firth of Clyde on 24 April, 2015. The site consists of a semi-circle of timber and stone on its E side and an irregular stone mound on its NW side. The central part of the site is hidden by estuarine muds. The first pair of timber samples was collected from the junction between the timber and stone semi-circle and the stone mound. The second pair of samples was collected from two substantial exposed parallel timbers 10m diagonally to the SE of the first pair. The three stakes were sampled from a group of stakes protruding from the estuarine muds, c5m to the NE of the second pair of samples. The site is in an overall poor condition and is deteriorating. A number of substantial timbers visible in various plans from the 1990s have been lost. Furthermore, both observations in the field and subsequent laboratory work demonstrate a large extent of decomposition of the timber component and attack by the shipworm, T. navalis. Sampling has been conducted to establish internal and absolute chronologies of Dumbuck and Erskine Bridge marine crannogs through radiocarbon wiggle-match dating of select contexts. 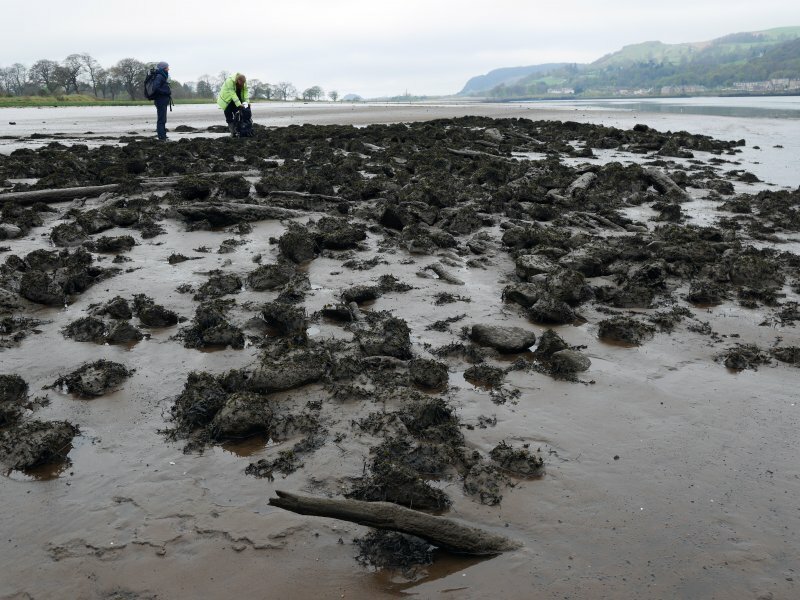 This will resolve the question of timber reuse and establish the foundation for building a precise chronology of intertidal settlement in the Firth of Clyde.